I stamped the cup of coffee from Pun Fun on watercolor paper and used my watercolor pencils and blender pen to color it in. I mounted the little cup on some dimentionals to give it extra interest. I also added some glitter glue to the little hearts to punch it up a little with some pizzaz. Here are the rest of the supplies I used. 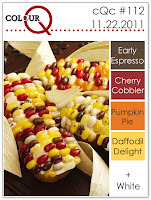 Today is Thanksgiving Day.....happy thanksgiving everyone! 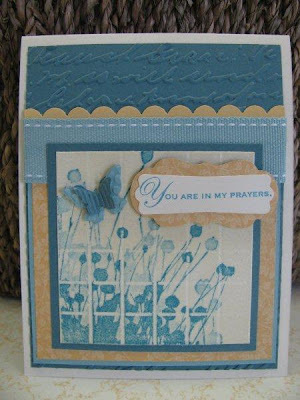 I have sooooo much to be thankful for, and one of those things is being able to have a creative outlet like cardmaking and being able to share it with others who think like I do! 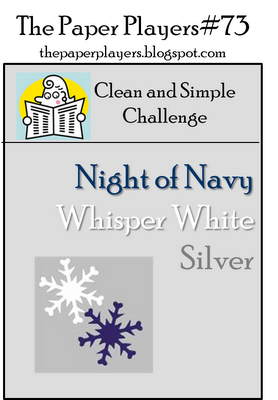 This card is for the Paper Players Clean and Simple Challenge #73. Clean and Simple is a challenge for me....to me, more is more! 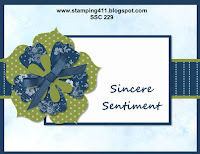 I admire all those clean and simple stampers out there! One good thing about C&S is the cards come together in no time. 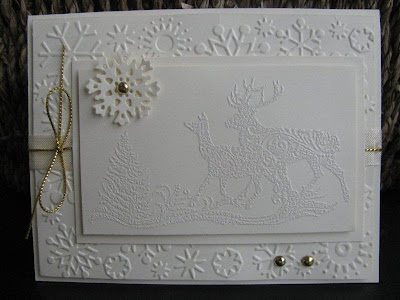 To make the snow I tore some paper and ran a little bit of glue over the edge and sprinkled dazzling diamonds on! Voila--glistening snow! Is there anything more beautiful that sparkly snow?? I think not! Here are the supplies I used. 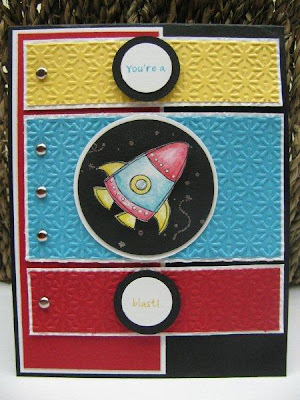 This far out card combine KaPow Kreative Challenge #5 and Mojo Monday 216. I added black to the color challenge because I wanted to rocket to be shooting among the stars in the night sky! Here are the supplies I used. Black, White, Cherry and Polkadots! 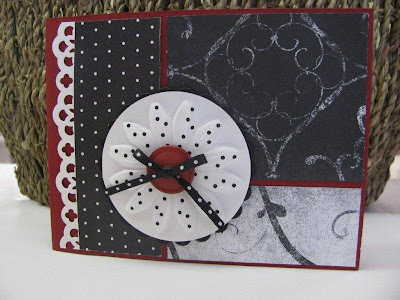 This card combines Creating with Connie and Mary Challenge 176 which is a sketch challenge and Crazy for Challenges 114 that asked us to make a card using black, white and another color of our choice. 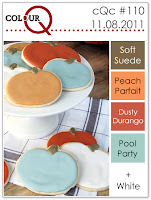 I chose Cherry Cobbler as my "wow" color. Accessories: Fabric Flower, Cherry Cobbler button, Lace Ribbon border punch, Polka-dot ribbon from Wal-mart, Scallop circle die, circle die. This card combines Pals Paper Arts Sketch 120 and Colour Q Challenge 111. I used a bleaching technique from Stamping 411. The technique used crumb cake card stock, bleached out stamping image and ink. The first time I saw it I knew I wanted to try it and I felt like this was the project to use it on! Here are the supplies I used. My card was also inspired by a bottle of christmas shower gel made by Bath and Body. I was in the shower and spyed the bottle and inspiration hit me! I had to quickly finish up, dry off and run down stairs to make this card before the inspiration was gone! Here are the supplies I used. 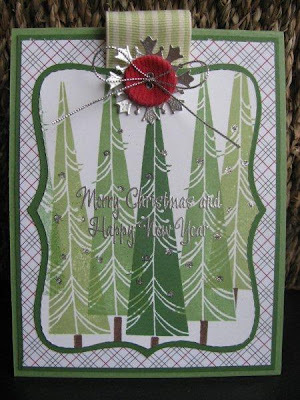 Accessories: Silver glitter, Real Red Corduroy button, Silver cord, Top Note die, Northern Frost die, Celery stripe grosgrain ribbon, Silver EP. 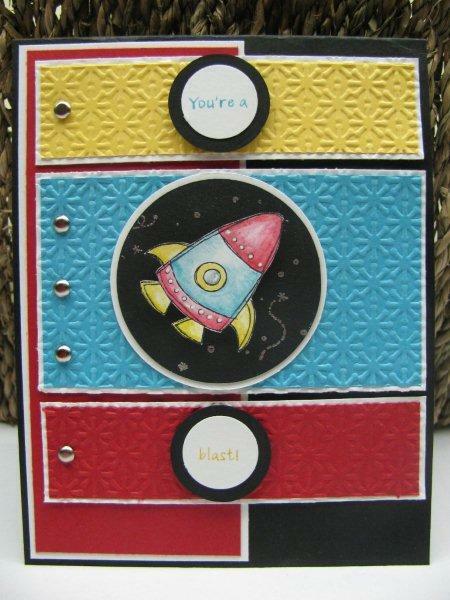 Todays card is for Creating With Connie and Mary's Color Challenge. Colors are Basic Black, Cherry Cobbler, and More Mustard. This is really an elegant looking color combo. Here are the supplies I used. 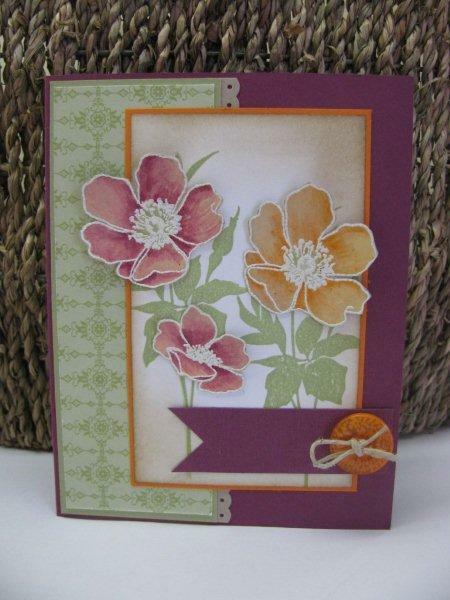 Todays card comes by way of Stamping 411 in the form of a sketch challenge. 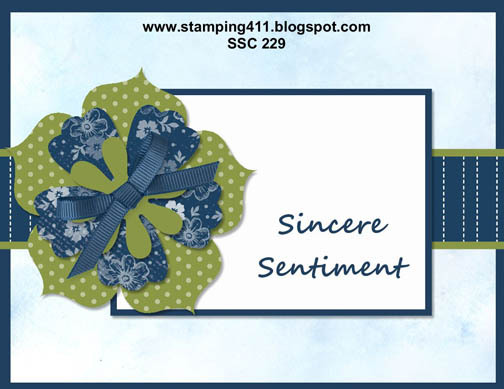 I really had fun with this card, plus I got to use my brand new set from Stampin Up called The Sounding Joy....and it sure is a beautiful set! 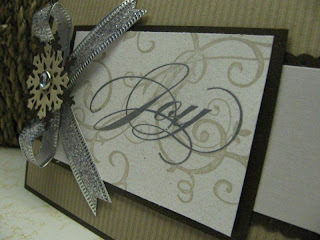 I embossed Joy in Silver and misted the main panel with Shimmer paint/alcohol mist to give some extra shimmer. I tried to show this in the 2nd photo, although I don't thing it showed up very well. It's always so much prettier in real life. 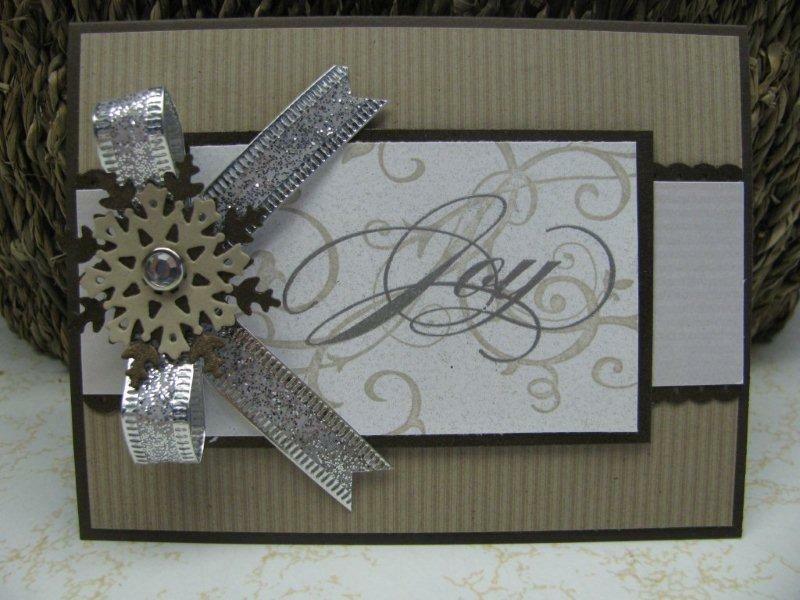 The paper I used is an older set of specialty paper that I ordered a while ago thinking I'd use it for wedding cards since it was so classy looking......again with the hoarding thing.....Anyway, I decided now was as good of time as any to use it and it would go perfect with the elegant Sounding Joy set. The brown paper is a shimmery bronze color and is gorgeous! I wish I had more of it now! Oh well! 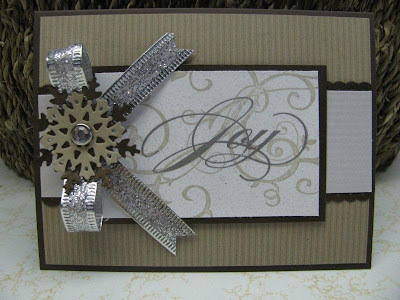 Accessories: Northern Frost Sizzlits Decorative Strip die, Shimmer paint/alcohol mist, Rhinestone brad, Silver EP, Dotted Scallop Ribbon border, Silver Glitter ribbon from Wal-Mart's christmas wrap section. 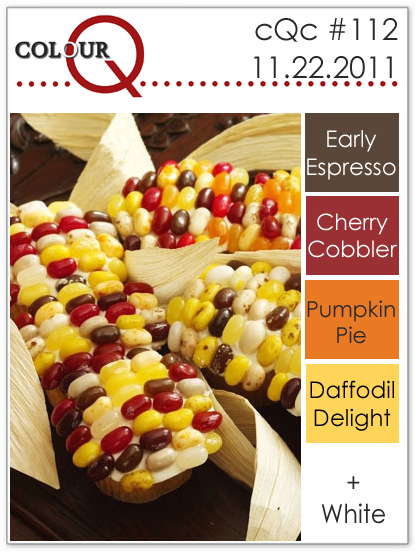 I loved this color combo over at Colour Q so much, I had to make another card. My shower curtain in my bathroom was also inspiration for this one. I used the Black Magic technique, which I had never tried before. 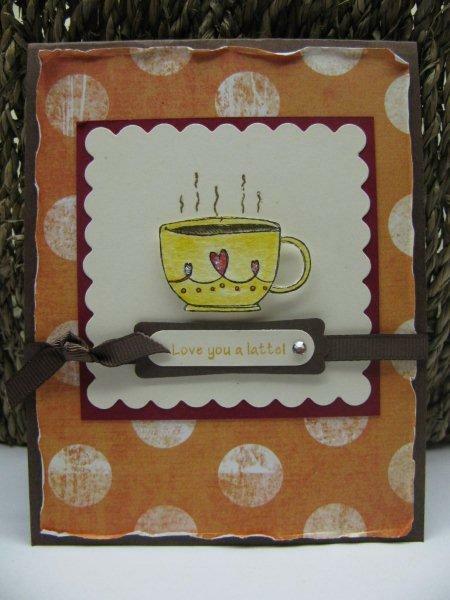 This card tweeks the color of the challenge just a bit because I used a panel of Early Espresso. Here are the supplies I used. Hey everyone! 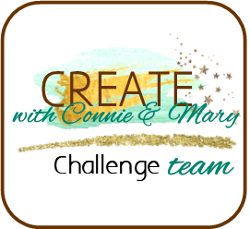 It's another Ka-Pow Kreative Challenge hosted by one of my favorite bloggers. 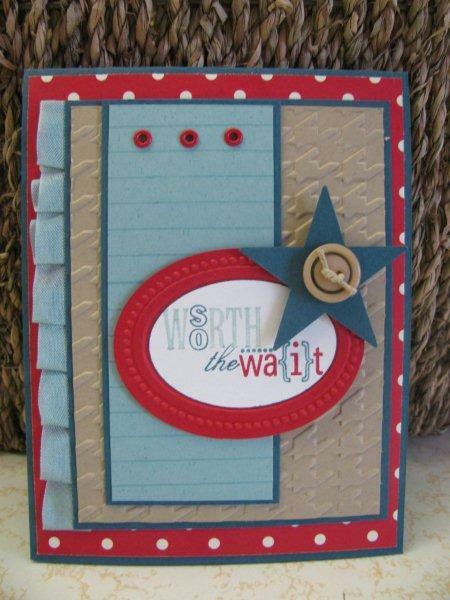 Check out Carrie's site if you havn't already...she's so talented! This time KKC05 is a color challenge....Real Red, Not Quite Navy, Sahara Sand and Baja Breeze. Right away these colors reminded me of the 4th of July, but I wasn't going there. Carrie made a neat christmas themed card, but I wasn't sure I wanted to go in that direction either. I knew I wanted to participate in the challenge, so I headed down to my stamping spot and laid out my paper. Ka-Pow! It came to me.....baby boy! These colors would be perfect in a baby boy card! Yes, my creative juices started flowing and this is what I ended up with! The only change I had to make was I used Crumb Cake instead of Sahara Sand. Here are the supplies I used. Thanks for taking a peek at my project! 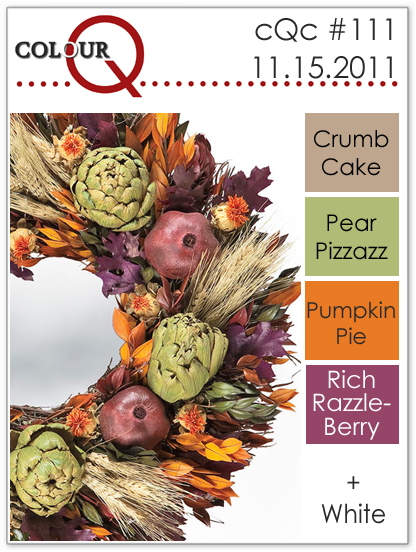 Have a great 11-11-11 day! P.S. wouldn't this be a neat day to have a baby? What a great birth date! 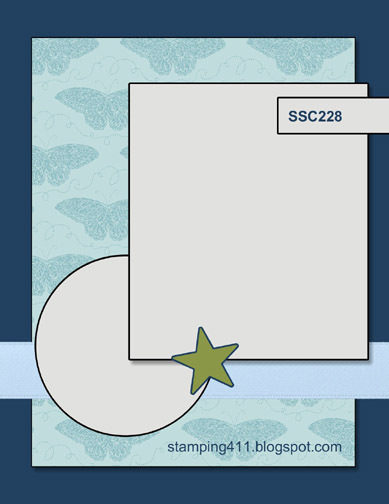 I made this card for Colour Q 110. 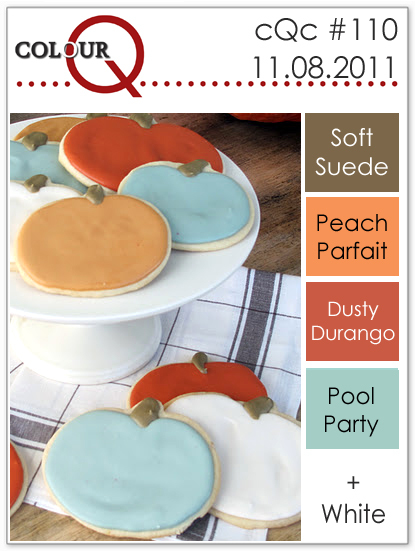 The challenge this week is to use Pool Party, Soft Suede, Dusty Durango and Peach Parfait. 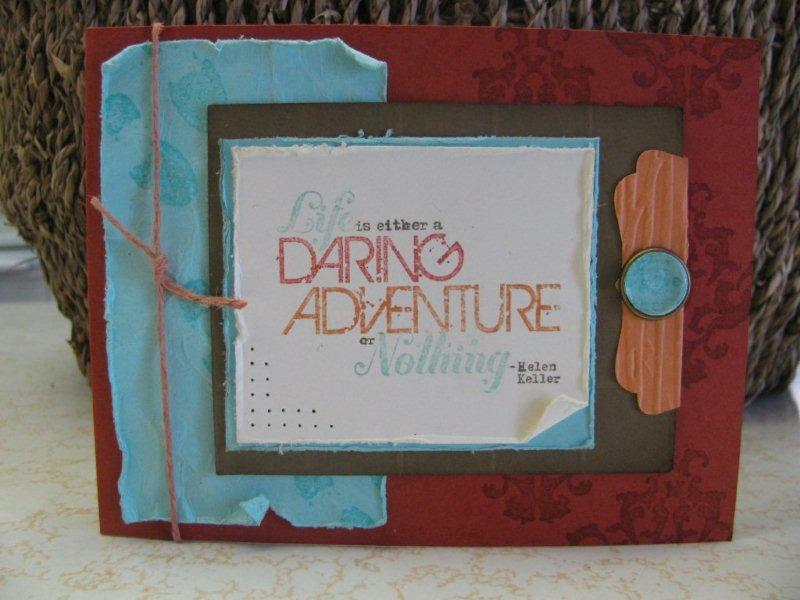 I used a newer stamp set to me called Daring Adventure. I like that this set is more masculine and these colors feel that way too. Here are the supplies I used. Thanks for taking a peek at my project! Why do I hoard paper? I have had this peice of torquoise designer paper since 2007 I bet. I know I'm not alone in this. Is it making sure we use it on just the right project? Or, what if we use that precious peice of paper and the project doesn't turn out like we had planned? I guess these are some of the reasons.....but there is always gonna be new designer paper that we like just as much or more, so why not use what we've got right now? Revelation!!!! Plus, as I was looking through the SU catalog, I see that almost this exact same pattern of DP exists in the brights paper stack! I can get more! Well, now that I've had that epiphany, I can talk about this card. This is for Mojo Monday 214 sketch challenge. 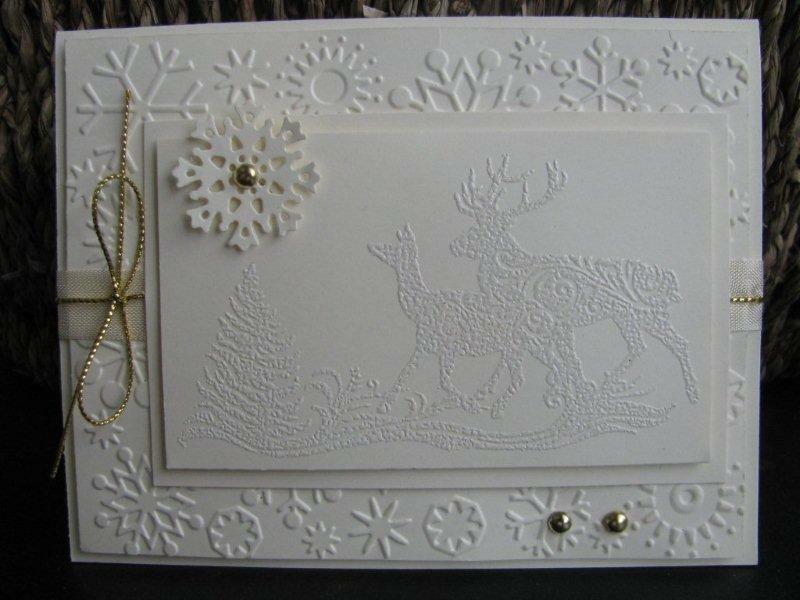 The main panel of the card is embossed with Irredescent Ice embossing powder to give sparkle. 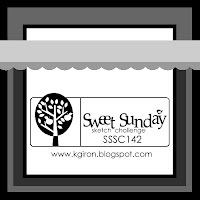 Here is my card for the Sweet Sunday Sketch Challenge 142. 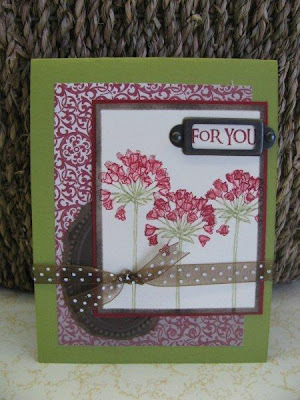 I have this flower stamp from Penny Black and I thought it might be a good one to try the tile technique with. I'm pleased with the results! Here's what I used. Accessories: Cuttlebug EF, Baja ribbon, Score Tool, Clear EP, Lots of Tags die, Butterfly embosslits, Scallop Border punch. Thanks for taking a peek! 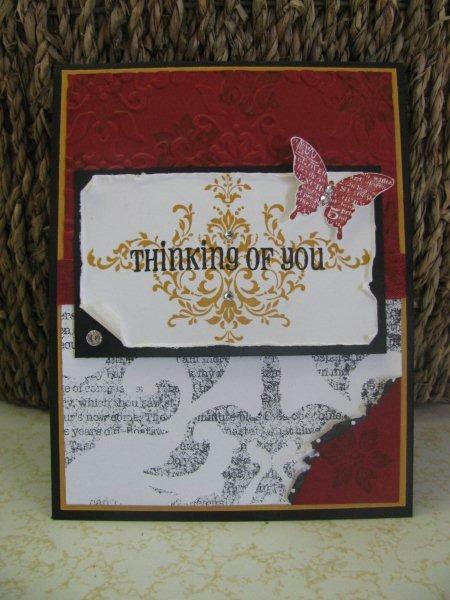 This card combines two challenges from the fabulous blog Stamping 411. 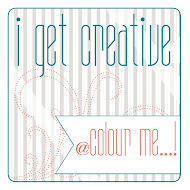 Challenge number one for me is Color Inspiration Challenge #164, which they host once a month. Colors are Riding Hood Red, Lucky Limeade (which I love and didn't think I would!) and Early Esspresso. Challenge number two in this card is Saturday Sketch Challenge #228. The colors definately lend themselves to a christmas theme, but I wanted to go in a different direction. Hope you enjoy! Thanks for looking. 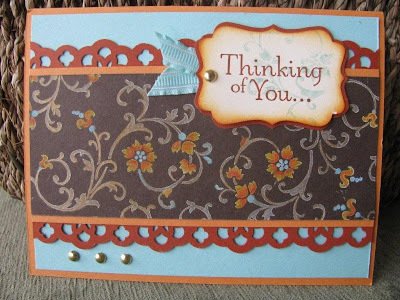 I made this card for the Our Creative Corner Challenge. 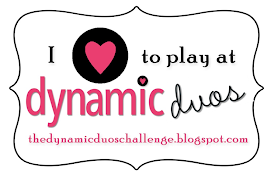 The challenge wanted us to make masculine cards, which is something I hear alot of ladies say they struggle with. 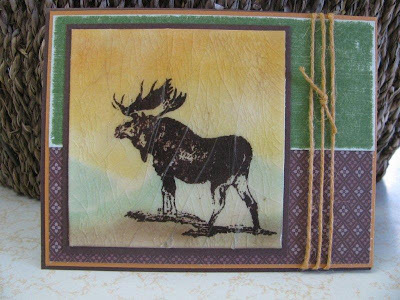 I used an elk image that I got at Hobby Lobby. 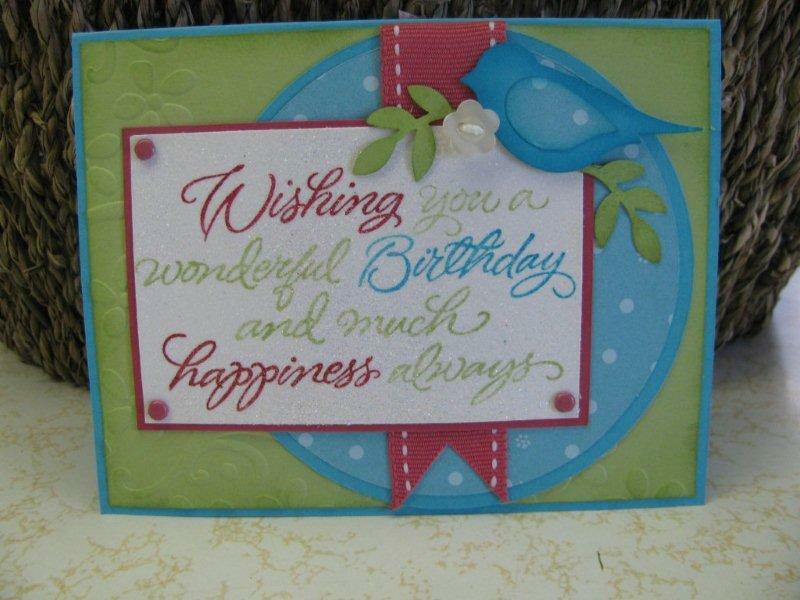 I stamped it in Chocolate Chip ink and sponged in the backround with More Mustard, Garden Green and more Choc Chip. Next, I did the cracked glass technique, which is one of my favorites! I love the look of crackled anything. Have you seen the nail polish that OPI makes that has the effect of cracked paint? It's fantasic! Anyway, back to the card......the card base is Choc Chip with More Mustard layered on top and then a panel each of Garden Green, which I distressed with a sanding block, and some Choc Chip DP. I embellished with a peice of mustard colored twine. Pretty simple. Thanks for looking! My boys and I had the most fun dressing up for halloween this year. 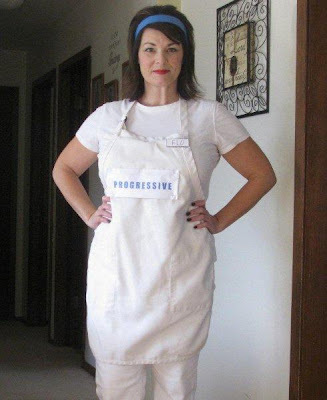 All of our costumes were pretty much last minute. I'd say we didn't do too bad, right?!? Here are some photos. 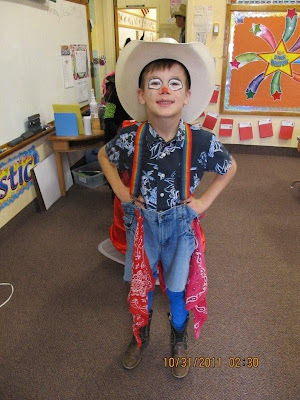 We had two rodeo clowns, one Flo the Progressive Lady, and a James Bond. Yay! 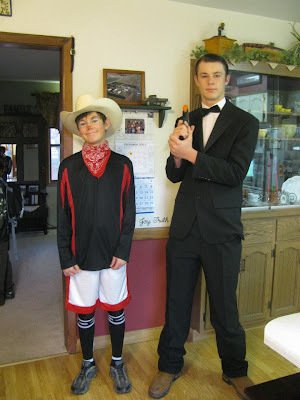 I made sidekick status again!!!! 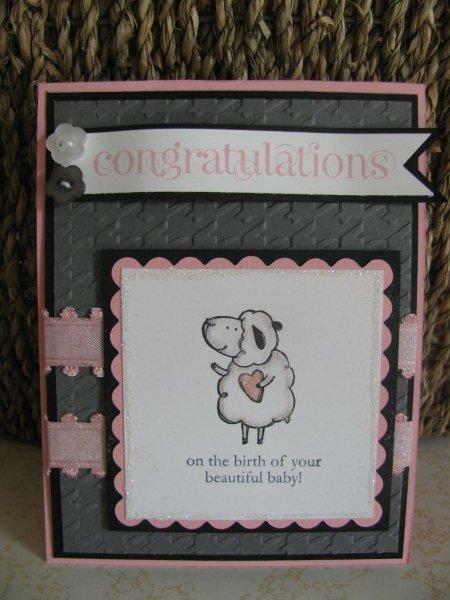 I made this card for a good family friend of mine whose wife just had their 5th girl! He now has his own basketball team! Go team Ator! 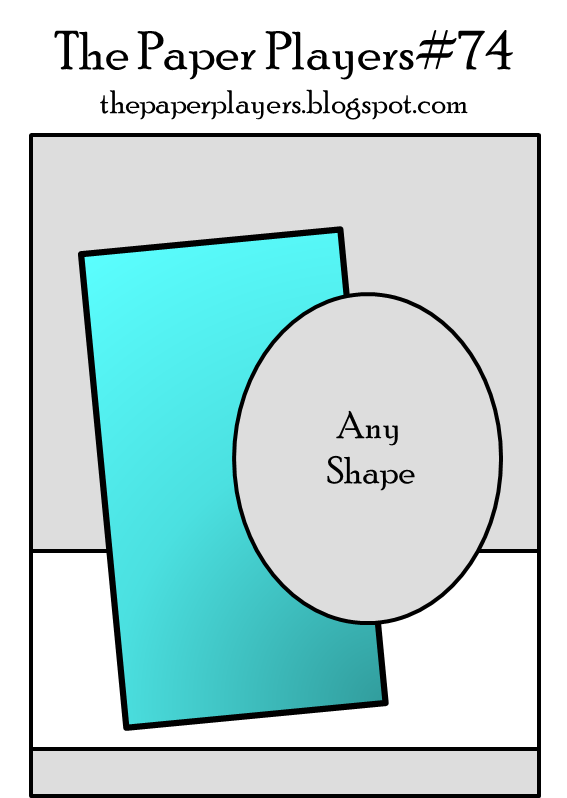 My card uses the pear image from Faith In Nature. 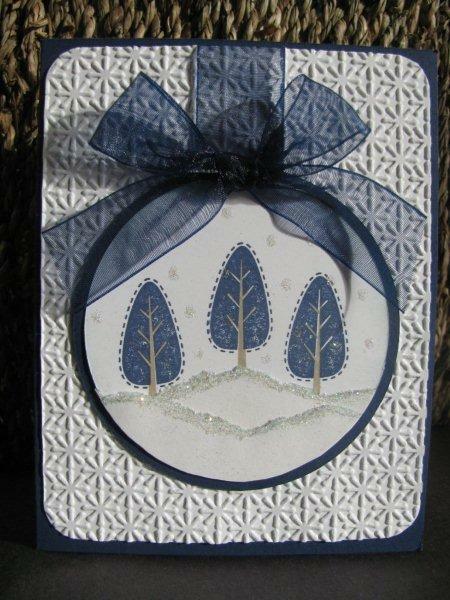 I watercolored it in the three colors for the color challenge, cut the image out with my oval cutting system from Creative Memories, and topped it on an Espresso scallop oval. Other supplies used were: Square Lattice EF, Dotted Scallop Ribbon Border, Vanilla Seam Binding Ribbon, Brown half pearls (Close To My Heart). I faux stitched around the whole card and spritzed the whole thing with my Champagne Shimmer Paint/alcohol mix. I love, love, love the shimmery look! Thanks for looking!